9:00 AM (Central time): We had a pretty good night! The girls got their costumes on and went to the Baptist church, where they ate and had activities (but I picked them up before they were done, because ours overlaps with theirs). Then I brought them over to our church for dinner #2, and then each class went on a scavenger hunt around town. How fun! I went home to hand out candy while they were gone. Unfortunately, Sophie decided she wanted to be with me, so they had to swing by and drop her off. We had lots of kids and handed out lots of candy (not not all of it unfortunately!). Then Sophie and I went back to church to pick up Elisabeth. They had lit a fire and were making s'mores. It was starting to get late, so we took off to do a little trick-or-treating. We went by the homes of two church members who had invited us to come. By that time, most of the lights were off in our neighborhood. We did find two houses that still had lights on and helped them finish off their candy, and then we went home, tired and happy. That was really fine with us, because it was getting VERY cold. (Why does it seem to get markedly colder on Halloween every year??) After I insisted they brush their teeth, they went right to bed. Needless to say, they each had a piece of candy with their breakfast this morning. 4:34 (Texas time) This is just a quick post to give everyone an update. We've been doing fine. The mission trip to Mexico went very well and was actually a time for rest and renewal for me. It sounds as if Susan survived without me for the week. Turnabout is fair play, I suppose, as she will be leaving this week for a conference in Atlanta, GA. The girls are doing very well. We just got their report cards yesterday for the second grading period and Elisabeth and Sophie are doing great. There are some things that Elisabeth is struggling with (a little) maybe because of the change in school systems (not that we're unhappy with her teachers in North Carolina--hi, Amy!). Sophie is having some minor struggles of her own, but mostly, for both of them, I think it's just a matter of concentrating and taking their time. Honestly, both girls are doing great in school, and we're pleased with where they are. Sophie goes in to the doctor on Monday for another check-up. One more month and she'll be done with her weekly antibiotic treatment and we will cross the first major hurdle post-treatment. All is well with her, but we've been working on some behavioral issues. Basically, the issue is that when Sophie is tired or cranky, every little thing is a major catastrophe. After a while, when there has been a series of otherwise minor issues that Sophie has turned into an international crisis, we're just fed up with all the dramatics. Mostly, I think it's not Sophie's fault. Susan and I are both *very* sensitive to Sophie when she's upset because we have been trained to be that way. But, we all need to be "un-trained," at least a little bit. In calmer moments, I've tried to reason with Sophie and explain that however she's feeling is fine, she just needs to express her anger/frustration/sadness/disappointment in ways that don't make it seem as if she's getting a dressing change (remember that trauma?). We're working on it, I guess, but when she's tired (or when we're tired), it's not an easy thing to stay on top of. She is an interesting child, though. I'm beginning to believe that we will always be trying to figure her out. Elisabeth is so much like me, I can read her pretty well. Sophie is her own person, so she is frequently a mystery. Mostly a fun, interesting mystery, but sometimes a frustrating mystery too! 6:30 AM (Central time): Sophie had a great day at the clinic yesterday! Randall may want to write more, since he's the one who took her to Lubbock, but it sounds like it went so well. Our appointment was earlier in the day than usual. Normally, we got o lunch first, put on the numbing cream and then head in to a 1:00 appointment. Yesterday, her appointment was at 10:30, so I put the cream on before they left. Randall said having it on longer must have made a difference, because she said she didn't even feel the needle when they drew the blood. In fact, she didn't cry or need her blankie (this from the girl who cries if she's the last one to buckle her seatbelt in the car!). She was really proud of herself when she told me about it at home. Sophie's blood values continue to look good. Only one test that was low ("MPV"--not sure what that's for, and it might be the same mystery one that was low last month), and her red blood cells (HGB) were toward the high end of the range. Randall said he had a really good visit with Dr. Prassannan. We had asked her about getting some cognitive testing done, because we had been hearing about some cognitive delays that can be associated with the treatment she received. She gave us a referral quite a while back, and of course we didn't do anything with it yet. She wanted to let us know that they recently changed her protocol to include cognitive evaluations on all patients (she said delays were more likely with patients who received brain radiation, which Sophie didn't). Interesting, and maybe that will motivate us to set up an appointment! I think partly, we have put off getting her tested because I don't want to think that this treatment (which we absolutely had to give her) might have had negative effects on her. And we also will never know whether the treatment caused the delays. I figure we can't undo any current or future damage just by knowing the results of some tests. I think we had almost come to the point that we might just wait to see if she is showing signs of cognitive delays and get her tested at that point. If she's not having problems, then there's nothing to worry about. I don't know if that makes any sense! The other big news of the day is that I joined the Clovis Community Band--my first practice was last night, and it felt pretty good. I have really missed playing music! So, I'm leaving in a few hours for Atlanta. There's a conference of criminologists meeting, and I'm doing a presentation Wednesday morning about what we learned from our interviewers during a study we were doing of prisoners being released to the community. How talking with prisoners (in prison and then three times following release) changed their perceptions of prisoners and the criminal justice system, and what advice they would give policy makers for working with this population. It's part of a larger set of presentations on our study findings. Neat stuff. Well, I'd better get the girls up, and get packing! 6:20 PM (Central time): If you are visiting this blog because you heard a news story about a little girl named Sophie who has leukemia and received a death threat on her blog, you've come to the wrong blog. The Sophie you have heard about is 9 years old, lives in England, and her web site is here: http://www.codebrush.com/sophie/. Here is the news story, in case you haven't heard about it and wonder what we are talking about: BBC News story. We figured out what the confusion was when we started getting messages of support from people that didn't make sense to us (we haven't been on BBC News!) and did a google search for "Sophie cancer". We hope this unwanted attention dies down soon for our friend Sophie from across the pond, and we certainly wish her well as she continues treatment. No big news from this Sophie. She came home sick from school today, having thrown up. She spent the afternoon napping, and we hope she will be fully recovered tomorrow so she can go to kindergarten and enjoy the Thanksgiving feast they have planned. 2:30 PM (Central time): We had a good Thanksgiving. On Thursday morning, we flew to Houston (it would have been a 9-hour drive) to visit his sister Sabine (who lives about 90 miles northwest of there). Her three girls (all young adults) were there, and Randall's mom flew in not long after we did. We had such a good time while we were there. Sophie had never met her cousins, and Elisabeth hadn't seen them in years. They totally hit it off, and we spent a lot of time talking (and eating) and laughing. It was good to gather round each other and just be together. We had to come home Saturday morning (so Randall could preach on Sunday), but it was a good visit. It snowed here while we were gone and has been cold ever since. I think we might have to get used to real winters and actually use our coats. It's a good thing I work at home and don't have to go out much! After we got home, we packed up all our fall decorations and started getting out the Christmas decorations. One thing we did was pack away our china that we normally display in a small built-in cabinet in our dining area. In its place, we are displaying my grandmother's collection of Santas. I really enjoyed unwrapping each one, looking at it, and deciding where exactly to put it in my little display, remembering my grandmother with each one. Elisabeth really wanted to help me, but I so wanted it to be a private moment (plus I didn't want her to break anything). Once I got over myself, I let her help me some (but I still wanted to decide where to put each one--her arranging skills need some work). Maybe if I weren't such a control freak! We still have many boxes to go, and there will be plenty of opportunity for both girls to arrange lots of things. 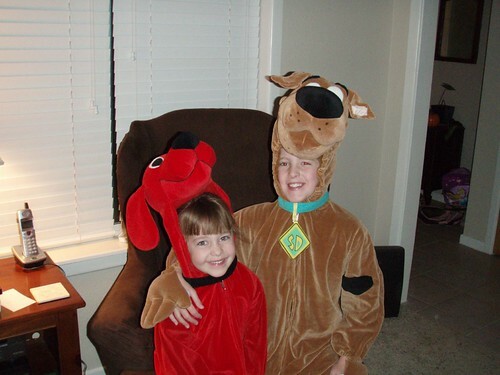 This is a shot of the girls on Halloween (Clifford and Scooby). 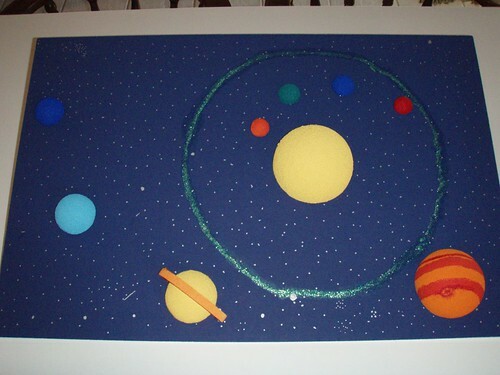 Elisabeth's Solar System project--she had some help, but we all had fun planning it and making it! 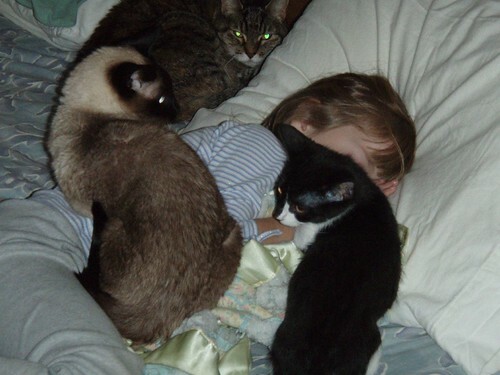 Sophie occasionally takes a nap in our bed--this is usually the result (a kitty pile-up). 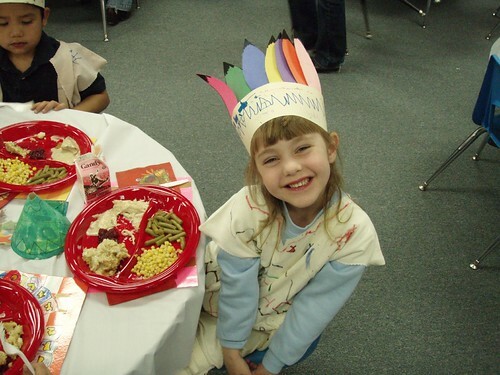 The Farwell Kindergartners had a Thanksgiving "Feast" last week. This is Sophie hamming it up. 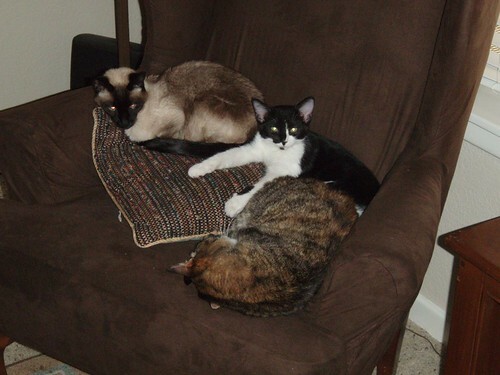 Our new kitty (Felix) seems to be making himself right at home--not so sure how the others feel about it!